A few weeks ago, I posted about my dilemma with defining my quilting style. Many of you posted wonderful, insightful comments that helped me think more about this whole challenge of defining one's quilting style. A couple things initially spurred on this thought process for me. I had a discussion with someone at Sew South about the "definition" of modern quilting and the potential negatives from the Modern Quilt Guild's definition. Following that, I received a request from a guild rep looking for a modern quilter to present at their guild. I started to really wonder if I am a "modern quilter" and if I should use that term to describe myself when many of my quilts don't meet the definition the Modern Quilt Guild has created. Then I uncovered this gem when sorting my batting last week. I will be the first to say this is not my usual style, but it is a project I created nearly five years ago. Even back then I wasn't in love it with which is why it ended up in the bottom of my batting bin to be forgotten about and found again five years later. Rediscovering this old project clarified things to me a bit more. It's not my style, but I don't regret making it. I view my quilting process as an experiment. I learn a lot from each project I create, which is why I rarely shy away from new styles and techniques. With this particular quilt top I taught myself how to sew diamonds. I learned that I don't like heavy borders. I learned that there are right ways and wrong ways to do certain things. 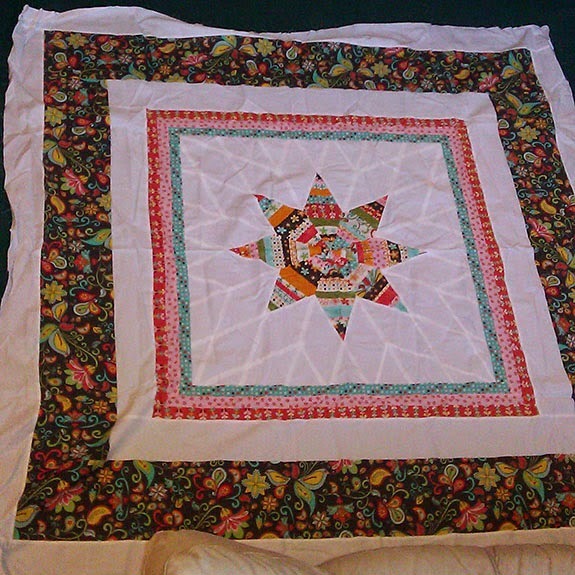 This was one of my first quilts. I remember messing up on this project many times. The process of creating is why I do this, not necessarily the finished quilt. I love cutting up the fabric and creating something new and different. I love challenging myself to find inspiration in very random places. I love finding new ways to quilt. I love the feeling of satisfaction when I can look at a completed project and know that it came from my ideas and was created by my hands. My projects are not perfect, but I view each as a journey. When all of this ceases to be a fun, exciting, creative outlet, I will stop quilting. Until then: My name is Kati, and I am simply a quilter. We don't need definitions and words to clarify our style. We all just get to enjoy the process and do what we love. Thanks so much to each of you who commented on my previous post about style. I really appreciated your thoughts. Gosh, I am so glad you wrote this. Especially the second last point where you declared that you are a quilter. Period. I have been struggling with the definition of modern quilting and where I fit in and feeling a little out of place. My name is Vanessa and I am a quilter. Thanks for this post. I dislike the division that the term "modern quilt" has created in the quilting world. After all we all are just cutting up fabric and putting it back together in creative ways. I too am a quilter! I've been struggling with the fact that the modern quilt world is pushing for defining ourselves. I whole heartedly agree with a blog post I read recently (forgive me, I can't recall the author) that said if our great grandmothers were still around they would be whacking us with wooden spoons for losing site of the purpose of quilting... creating something beautiful and warm for our loved ones. We are quilters! Your timing on this is perfect, Kati. I almost started ripping a border off a quilt top I'm 3/4 of the way finished quilting, all because borders are no longer my style. Thankfully, I stopped myself and decided to finish the quilt as is. You're right, with each project we learn something new and even if the way we cut and arranged the fabrics and sewed them together doesn't turn out as perfect as it did in our minds, the effort is still worthwhile and valuable. And more than likely, someone else will love it, even if we don't. BRAVO for saying this and I too "am a quilter". Love your post. I belong to a Modern Guild and I really enjoy modern quilt designs, but I want to make things I find visually appealing and which will be loved by those who receive them. I wonder why we always feel the need to label everything! I too am a quilter! Hi, Kati! I too am simply a quilter. So well said- and received it seems. I am much more drawn to a modern aesthetic but still marvel at some of what is considered "traditional". I don't want to be defined- especially by someone else's definition. Tamie- a quilter. This is so well thought out and I totally agree with your conclusion - "I am a quilter". We are all engaged in a creative process and it seems a bit counter productive to try to define or create walls around our evolution as creative people. I also am in awe of the ingenuity and hard work of the original quilters - now regarded as "traditional". I find them inspirational - even though I am drawn to many aspects of the "modern" look. The intellect behind the original traditional quilting and the modernists continues to be awe inspiring to me. Thank you for putting into words what I have also been struggling with. The labels are too confining. I get frustrated going to our modern guild meeting and hearing people say something isn't modern. We need to make what we love and appreciate what others make. We are ALL quilters!!!! I agree; I quilt. I quilt for me. Yes, I give 90% away but I still quilt what I want to quilt. I always hope that the receiver enjoys it and I try to keep their tastes in mind, but I quilt because I enjoy it. Thanks for putting it into perspective. Great post. I too think about my "style" and if it fits in with "modern" quilting. I'm drawn to both outside-the-box designs as well as traditional blocks. Beautiful post, Kati! I have had the same feelings about needing to "define my style", as I am all over the place. But I LOVE LOVE LOVE the fabrics, the process, and just trying new things. I too am just a quilter.